I managed to get a last minute table at 1230, as they opened. The restaurant is housed in a small space below some new apartments. The owner and chef, Sam Harris, has chosen to furnish the place in a sleek manor. Simple white tables and chairs, minimal art adorning the walls and an open kitchen. The lush brown carpet did soften the surroundings somewhat. It gave me the feeling that Sam had been inspired by the surroundings and open kitchen at River Cafe. Little did I know he had done a stint there sometime ago. He has also worked at Bibendum, Harvey Nichols and as an inspector for Egon Ronay. The airconditioning was cranking and I was feeling chilly. I guess it can get quite warm when the stoves and grills are firing on full in the middle of service. The team were friendly and the menu fairly simple. I finally made my choices. Sea Bream Carpaccio arrived looking quite rustic. 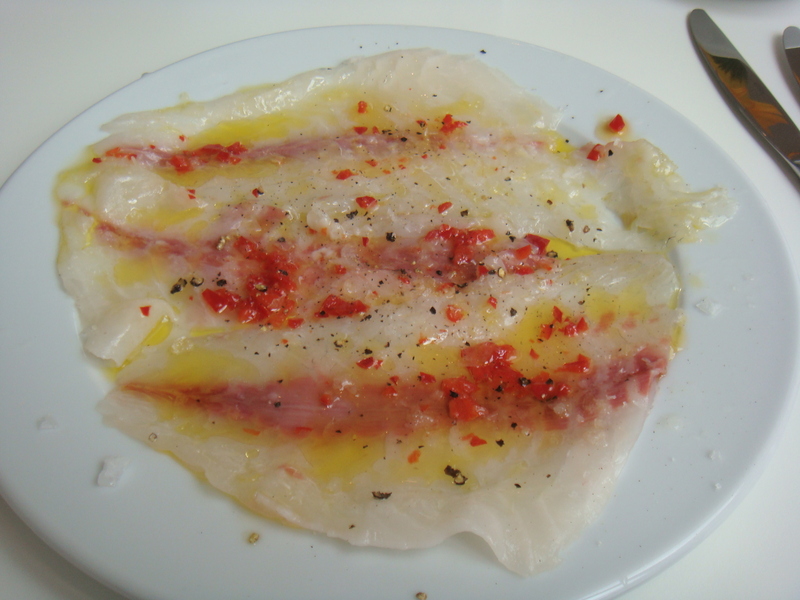 The bream was very thickly sliced, peppered with mild chilli, cracked black pepper, rock salt and olive oil. I have to say I really struggled to finish it. I felt it was drowned in the olive oil and I found it unpleasant to crunch into chunks of rock salt. I’m not sure about thick carpaccio either, kind of didn’t feel right. I like to order specials, if a restaurant is offering. 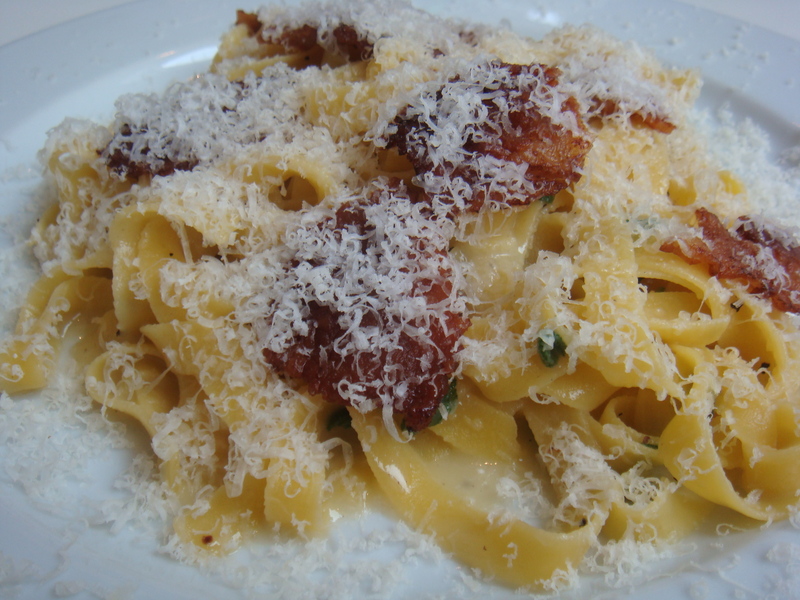 Today’s was pasta, Fresh Tagniatelli with Guanciale. The pasta was perfect, not over cooked and deliciously rich. The guanciale (cured pigs cheek) had been crispy fried and tasted like a salt bucket. I caught a bit of the cured pork flavour but was too over whelmed by the salt component to enjoy it. The dessert menu is recited by the waitress. I’m not sure why, as the menu is printed on simple paper which could be updated daily. Never the less I couldn’t fit much more in and decided on a simple Affogatto. The icecream was creamy and the vanilla bean seeds were densely scattered throughout. 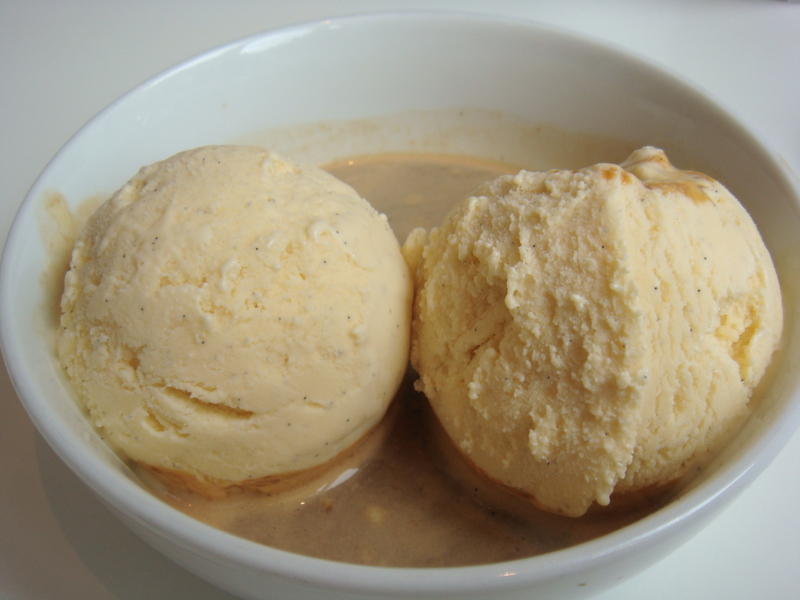 You can’t really go wrong with affogatto (it would be a sad place if they couldn’t get that right). So three courses with a bottle of water came close to £20. The place is not expensive, the food is ok but I wasn’t inspired or over whelmed by anything. The tables are quite close and the gentlemen beside me were loving every dish, as alot of other people have. 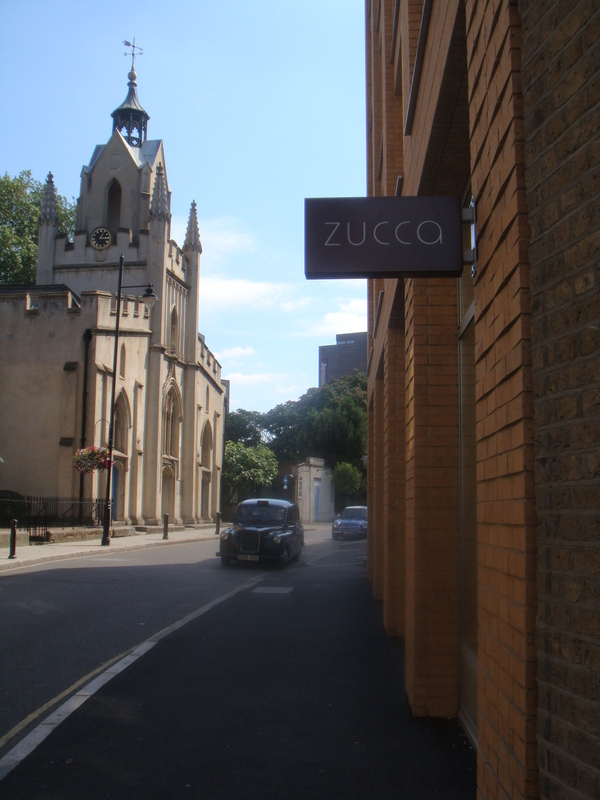 Maybe I didn’t get the best from Zucca that day but I didn’t enjoy my meal at all. As I sat there I saw the restaurant fill and they were turning people away. I couldn’t understand?? Is it the novelty of a new place to try on Bermondsey St, the need for reasonably good food at a good price in the area or all the good publicity it has been getting? I’m still not sure but I wont be knocking on their door again anytime soon.